The immense benefits of drinking tea are no news to most of the world’s population. However, in this article, we will be focusing on the best tea makers which are machines that can produce hot steaming tea for you, whenever and however you want it. Tea makers are machines for brewing tea just like the coffee makers we have. They have the ability to improve your tea brewing experience using timers, automation and accuracy to make the right blend of tea you want. Tea Makers look more like traditional kettles but are much more than that. They are electric kettles with four main parts for brewing tea. The first part is the water reservoir, which holds the water. The second is a heating element, which heats the water in the water reservoir. The third part is a steeping chamber, which accepts the water from the reservoir. The last part is the Pot, which holds the tea for serving after spending some time in the steeping chamber. The best tea makers are durable and handy devices to have around the home whenever you have the need to treat yourself to a delicious cup of tea. As useful as tea makers are, there are many brands and models out there in the market. With this number of different tea makers available, picking the right can be hard if you have no basic knowledge of what to look. To help you, the following are the important tips you should know. The best tea makers heat water quickly regardless of your brewing preferences. This saves time and makes you brew your tea the instance you want it. Most tea makers have temperature settings, which allow you to select a preset boiling temperature of your choice. What many of these tea makers do not have is the ability to fine-tune the temperature to an appropriate one for delicate tea brewing. The best tea makers have the feature of allowing precise temperature boiling. Not everyone gets to brew his or her tea and drink immediately. Some people like to wake up to a cup of already brewed hot tea while others prepare their tea and drink it later. The best tea makers have the ability to maintain the brewing temperature of a tea for a good number of minutes after brewing. The best choices for tea makers are those with glass or stainless steel construction. These designs of tea makers are sturdy, durable, rust and BPA free. They are also easy to clean and will last you a long time. Based on our three-step process , here are the top 4 best tea maker you should consider buying. The following are four of the world’s top rated tea makers in the market. These products have many recommendations and positive users review. We can also confirm that these products have great quality through our research and are worthy of their hype. The French Press Coffee & Tea Maker is a versatile device which can function primarily as tea and coffee maker. Frothed milk, fruit infusions, iced tea etc. are other blends of drink you can also use this tea-making machine to prepare. Its ability to do all these makes it arguably the best tea maker on the market. 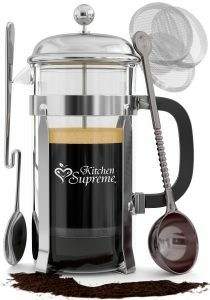 Modern and strong carafe: The French Press Coffee & Tea Maker has a resistant and strong carafe. This is because it has a construction of a glass that does not break even at high temperature. This glass is Borosilicate glass. The design is attractive and shining, thus promising to add more glamour to your kitchen. Four stainless steel filter screens : No tea maker has four number of filter screens except for the French Press Coffee & Tea Maker. These numbers of filter screens ensure that sediments never get to interfere with your tea. Regardless of the size of your tea-leaves particles, your cup of tea will be sediment free. Versatile functions : The number of tasks you can use this device for asides from brewing tea is endless. You can use this tea maker to make coffee, frothed milk, cashew milk, plant tinctures, fruit infusions etc. When you buy this product, you are buying more than a tea maker. Double screen system : This feature ensures that every drink you brew in this machine never has a coffee ground taste in your mouth. This machine is dishwater safe. Quite durable and long lasting. This tea maker is rust and BPA free. It gives you the right blend of drink regardless of what you are brewing. The ball on top of the plunger is fidgety when you want to clean the device. The Breville BTM800XL Tea Maker is a fully automated one-touch tea-making machine with impeccable quality and durability. This tea maker is programmable and can thus make you brew your tea in many different ways. Because of its features , the Breville BTM800XL is widely known as one of the best automatic tea maker. There are lots of benefits when you get this tea maker. Firstly , this Tea maker can be automated. 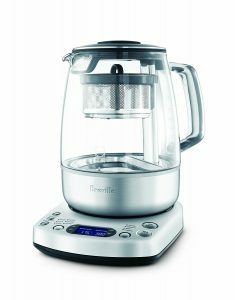 At the push of a button , the Breville automatically moves the tea basket up and down, thereby shaking the tea leaves for your tea to steep well. There is a basket button, which caters for this feature. All you have to do is press the button and watch the in and out immersion cycle of the basket. This feature allows a tea to keep warm for 60 minutes after brewing. It enables you to enjoy your tea at the same brewing temperature later. If you like to wake up to a pre-timed hot cup of tea but not ready to get out of bed, you will find this feature fascinating. With this feature, you can customise your own brewing temperature for all kinds of tea you want to prepare. Using this feature, you can use the Breville BTM800XL Tea Maker to boil water to any temperature of your need. All you have to do is take out the steeper and use the device as an electric kettle. This tea maker comes with some pre-programmed settings for special kinds of teas like Oolong tea, black tea, green tea etc. You can also program your own brewing settings, which remains stored for any time you want to prepare tea. An LCD timer on this tea maker helps you to monitor the freshness of the tea. It gives the precise time difference between the time of brewing and the present time. 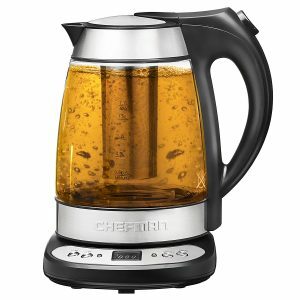 This tea maker has a 1500W heating element, which works with all 60Hz and 120V outlets. It has a steel and glass construction, which is attractive to display, and gives your kitchen more elegance. It is fully automatic in operation. Your tea can maintain the same temperature after brewing. You can use it as an electric kettle. It has precise temperature control. The power consumption of this device while brewing tea is low and this is one of its amazing features which ranks it as one of the best tea maker. It is precise, power efficient and has an attractive look. This tea-making machine has 10 different temperature settings that allow you to brew several varieties of teas at the precise temperature. This gives you lots of brewing options for the blend of tea you want. This feature allows you to keep 1.7 Litres of tea for 60 minutes at a particular temperature after brewing. It allows you to enjoy your tea at the same brewing temperature later. If you like to wake up to a pre-timed hot cup of tea but not ready to get out of bed, you will find this feature fascinating. Unlike many tea makers, which lids do not open easily or fully, the Chefman RJ11-17-GP 1.7 Litre Tea maker’s lid opens fully when you press a button. It opens and remains so until you close it. The lid also closes proper with a snap, therefore sealing shut and secure manually. The tea-kettle sits securely on a base. The base has a 360° swivel and contains the programming and settings buttons. This swivel allows you to turn the tea maker in any direction you want. It is easy to use and program. It has audible and pleasant alert beeps. It comes with a boil dry sensor to protect it. Has an attractive look with a warm blue light. The water level markings are only on one side, thus making it difficult to gauge the contents on any side when pouring. 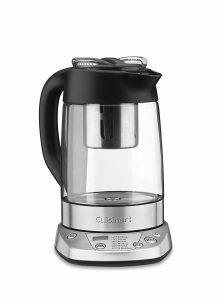 The Cuisinart Programmable Tea Maker is a tea-making machine that requires you to manually raise and lower the steeping basket. It gives a sound prompt to tell you when to raise or lower the basket. Its recommendations and user reviews make it one of the bets tea makers around. This tea maker has six different temperature settings for brewing the kind of tea you want i.e. delicate, white, black, herbal, and green and oolong teas. This ensures that any variety of tea you wish to prepare steps properly to bring out its flavour. This is a part of the device that you use for steeping. It has a construction that ensures it holds both bagged teas and loose teas. It can also hold fruits, spices and herbs if you want to make a customize blend of tea. This feature enables you to set how much steeping time you want for your blend of tea. You can also choose to use the pre-programmed steeping times it comes with spending on the variety of tea you select. This feature allows a tea to keep warm for 30 minutes after brewing. It enables you to enjoy your tea at the same brewing temperature later. This feature will come in handy for those who might need to engage in other activities that may exceed beyond the brewing time. The Cuisinart tea maker has this feature to ease your brewing activity. With this feature, your tea is always ready for refills at all times. You can use this device as an electric kettle by removing the stainless steel infuser. You can get up to 1.2 Litres of heated water for other purposes other than tea making. This tea maker has an overheat protection and boils dry protection. This prevents it from damage by overheating or dryness due to boiling. Has 30 minutes keep warm feature. It has a perfect memory feature. Its steeping basket is accommodating. Comes with a recipe booklet. Teas are more than just delicious and comforting beverages. They have remarkable health benefits and healing properties. Therefore, buying the best tea maker that makes it easy to prepare this beverage is a good investment. Some of the best tea makers double as electric kettles or makers of other beverages asides tea. There is no con in investing in this device.